Yesterday was our 31st wedding anniversary and since both of us like sweet things, I decided to make red velvet muffins. I have had this recipe for nearly 2 years in the ‘to try list’. Yes, that list is not getting shorter as so many food bloggers come up with wonderful recipes. I came across this recipe on My Diverse Kitchen 2 years ago. 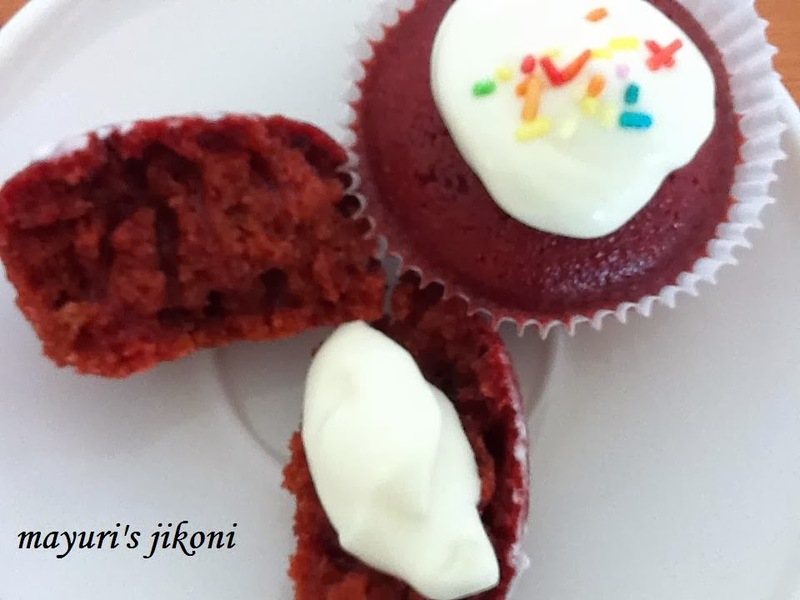 I too had never heard of a red velvet cake or muffins till I came across her recipe. After that, I have come across so many recipes but most use artificial red colouring which was a big put off. During my visit to Bangalore, I finally tasted a red velvet muffin and liked it. Initially the thought always was that how would a red cake taste or one with beetroots in it. Well, let me tell you the beetroot makes the cake softer but in no way hampers the taste. I made a cream cheese topping to go with it and it was a perfect balance of sweetness and a bit of tanginess. 31 years of marriage has had its shares of ups and downs but we have weathered all sorts of storms together. A few days ago my friend’s son shared an article (http://sethadamsmith.com/2014/01/20/true-love-is-painful) with us and I found the article so true, profound and an eye opener. Even after so many years of marriage, we still learn more things about our partners as we all keep on constantly changing. We change our habits, our temperament, our thinking with time and age. A marriage is not just a bed of roses but it also has thorns which we slowly pick out and throw away to make it better. Line the muffin tray or cups with a paper cups or grease the muffin tray lightly. Sieve flour, salt, baking powder and cocoa powder together into a bowl. In another bowl add the beetroot puree, oil, vanilla extract, sugar and milk. Whisk the liquid mixture for a minute or so. Add the flour mixture to the liquid and mix just enough so that the flour gets all wet. Spoon the batter into the prepared tray or cups by filling it three quarter of the way. Bake the muffins in the hot oven for 20 to 25 minutes. Insert a toothpick or a fork into the middle of one muffin. If it comes out clean the muffins are done. Remove the muffins from the tray or cups and let them cool down completely on a wire rack. In another bowl add the cream cheese, butter and vanilla extract. Whisk the mixture till it is smooth. Keep on whisking the mixture and start adding the sugar, quarter cup at a time. If the weather is really hot like here, the frosting may appear runny. Keep it in the fridge for 10 to 15 minutes before piping it on the muffins. Use any frosting that you prefer. Peel and steam or boil the beetroots till they are done. Cut into small pieces and puree it with a little bit of water in a liquidiser or in a food processor. Don’t be tempted to add more cocoa as they red colour may not come out correct. I used normal cadbury cocoa powder. If you don’t want the muffins to be too sweet, add only 1 cup sugar. Serve the frosting on the side with the muffin.